The show took place at the prestigious 21,000 capacity Earls Court Arena in London. The Adrenalize album had been released on 30th/31st March. The new In The Round stage featuring the new album cover design and a huge movable lighting rig/drum riser had been unveiled in Dublin just a week earlier. The venue had been the site of legendary concerts in the 1970s by David Bowie, Pink Floyd, Queen, Elton John, The Rolling Stones and many others. Initially five UK dates had been announced for the Adrenalize UK In The Round tour with ticket demand so high that second nights were added in Sheffield, London and a third night at the NEC in Birmingham. At 21,000 capacity the two nights here at Earls Court were the largest headline shows the band had played in the capital city and they remain so to this day. The band were supported by Scottish rock band GUN who played a short six song set featuring songs from the first two albums. They were currently supporting their latest album 'Gallus' and had been personally requested as the support act for the tour by Joe and Sav. 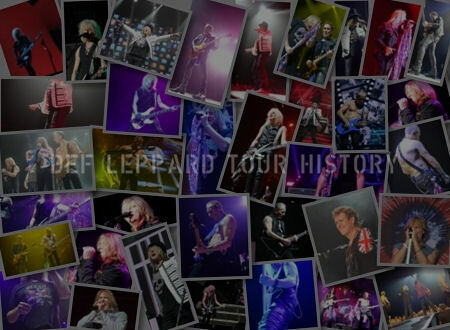 A total of 20 songs were played, most of which had been road tested on the 13-day club tour around Europe. One extra song not played on that tour was the new acoustic instrumental track 'S.M.C.'. This was played as the intro to the new acoustic/electric version of 'BOTH' and would later be released as a B Side in 1993 when its title was also revealed. 'S.M.C.' standing for Stephen Maynard Clark. Originally written by Phil as a lullaby for his son Rory who was still a baby at the time. 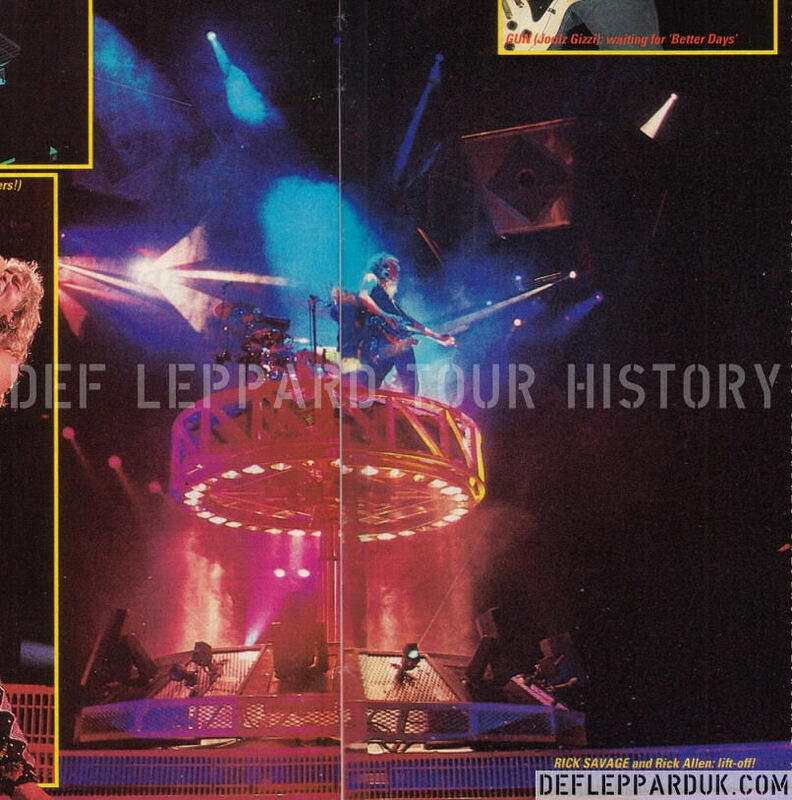 The second London appearance of 1992 after the Freddie Mercury Tribute show. 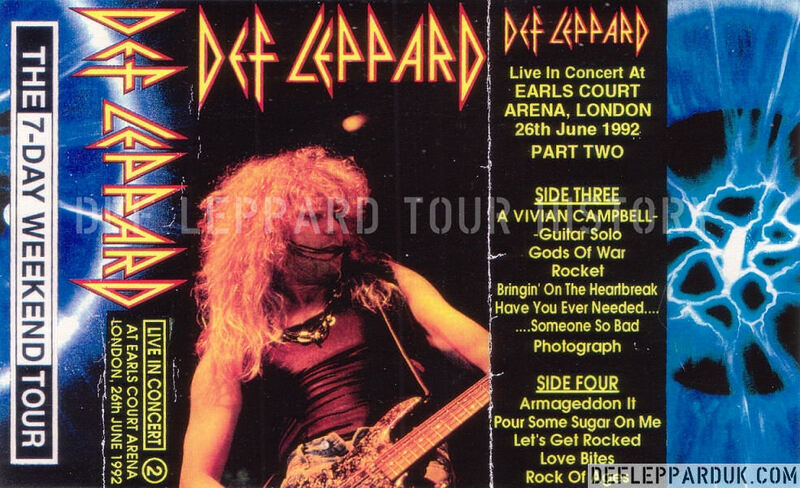 The band had not played headline shows in London since their two night stand at Wembley Arena in April 1988. 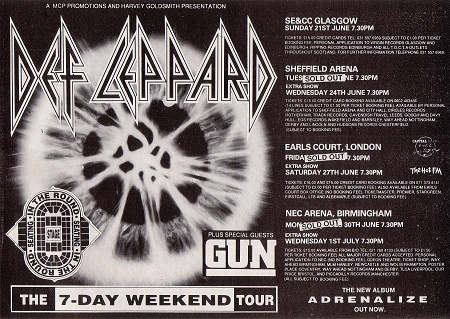 Their first ever UK arena shows. View photos below and read a review from UK magazine KERRANG!. Sadly the arena and exhibition centre was closed in December 2014 having opened in September 1937. Deolition work began after this and has now been completed to make way for luxury flats and apartment buildings. The entrance to the arena can be seen below. The house where Phil Collen first joined the band in July 1982 is located only a few minutes away in Warwick Gardens. "Earls Court in London. Thanks for having us. Thanks for coming. Goodnight!." 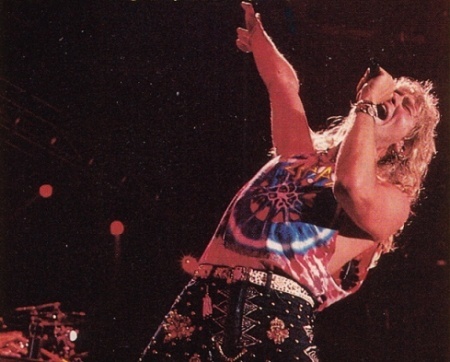 "The heart of rock and roll is beating strong in London Town, long may it beat!. Until next time, and there will be a next time!. Take care of yourselves and don't forget us 'cause we won't forget you. Goodnight." Gun have the bit between their teeth and are competing very hard indeed. Most people, however, have not anticipated such an early start, so the arena is barely two-thirds full for the Glaswegians' 'sweet-as' half-hour set. Gun appear to be just about coming to terms with playing in-the-round. Frontman Mark Rankin demands that all of the four front rows must at least get to their feet, whilst his colleagues make the best of their dull sound by throwing themselves into their work. But, as the song says, there will be 'Better Days'. A poster currently adorns the walls of some Tube stations drawing attention to an Evangelical mission to London - and it's occurring at this very venue in the hall next door. 'We're not asking you to believe in miracles', it states, before adding; 'all we're asking is that you come along to see, hear, and decide for yourself'. It's a message that could clearly also apply to Def Leppard. The band are finally appearing in-the-round over here, thus giving home audiences a chance to see a real American-style arena show for once. Four years ago they were prevented from doing so due to safety restrictions and red tape, but the back-room boffins have come up with a sleeker and lighter rig and PA which won't bring roofs crashing down. 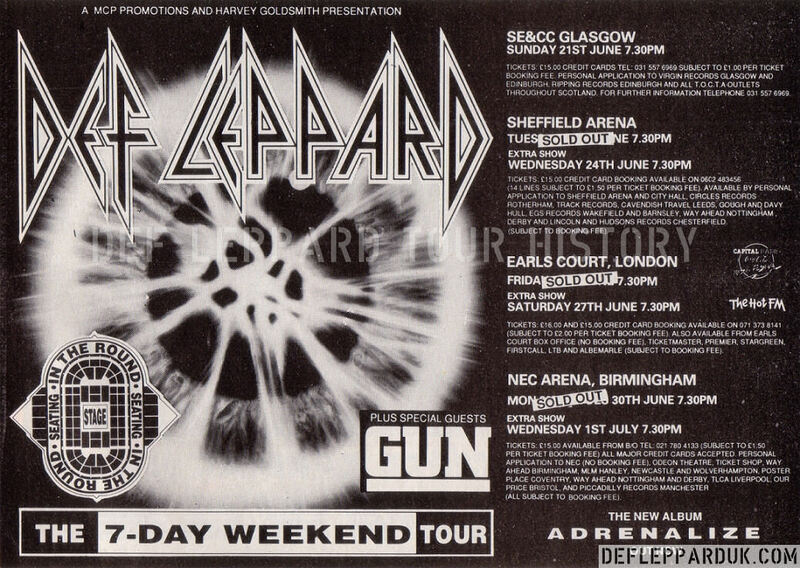 You've got to hand it to Leppard for their persistence. As showtime nears, few people notice the flight cases being wheeled in, but they contain the members of the group being smuggled under the stage. However, when the lights go down and the curtain/teepee finally shoots up to the strains of 'Stagefright', Earls Court erupts. This clearly is an event. 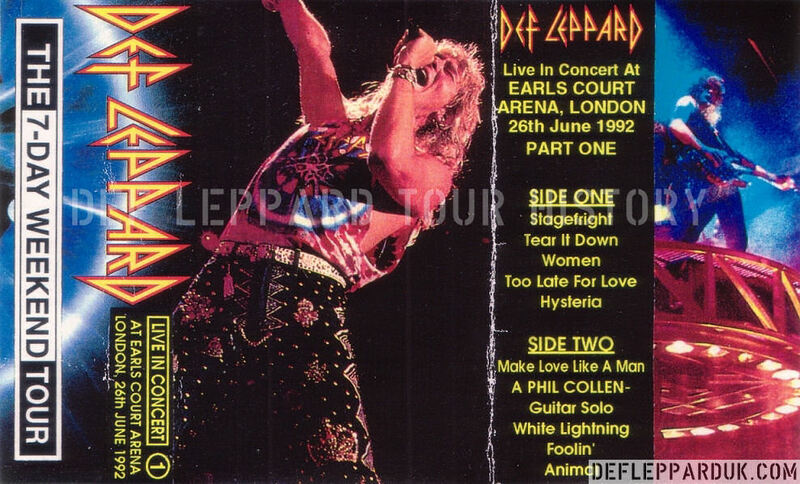 'Joe Elliott's trouser sense has not improved': 'New Boy Vivian Campbell looks like a member of Metallica dressed all in black'; 'Tear It Down' - the first 'Adrenalize' number of the night - is a prime slice of of enormodome rock'. The pen scribbles such brief notes as the eyes try not to miss anything happening on a stage smothered in a cascade of reds, blues and purples. The tempo is taken down with the haunting 'Women' and 'Too Late For Love'. Green circles drift across the set, reminiscent of those moments in 'Captain Scarlet' when the Mysterons resurrect another victim in their fight against Spectrum. 'Hysteria' then washes and soothe, almost relaxing until a twin break from Viv and Phil Collen kicks in. 'All the way from Walthamstow', Collen is the first of the duo to solo. Vivian's comes three songs later and the Irishman's is actually the more bearable of the two, being, dare I suggest, more in the excellent Dann Huff vein. By the time 'Rocket' arrives. 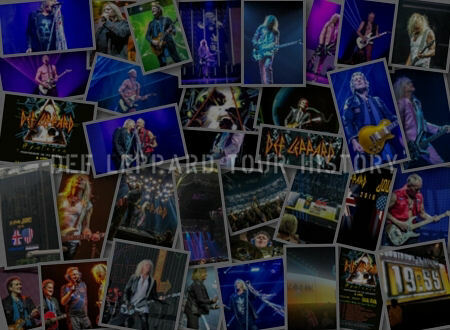 Leppard know they have a captive audience. 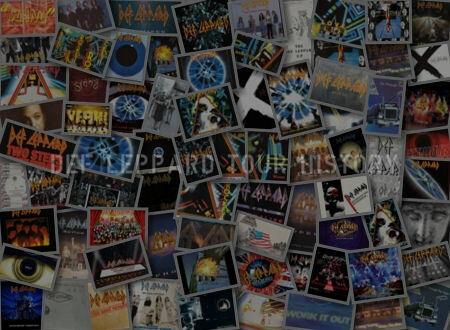 Yet sometimes it's so slick it almost seems incidental that those five guys up there are actually in on the party, for Leppard have got this thing so well rehearsed and so damn impressive that you sometimes wish they'd do something off-the-cuff or even - heaven forbid - make a mistake. But Elliott reveals he's far from the untouchable superstar rock god by joking that he's bursting for a pee, before grabbing a guitar for an acoustic version of 'Bringin' On The Heartbreak'. That's followed by by the pining ballad 'Have You Ever Needed Someone So Bad' from the new record, which is one of the few songs on 'Adrenalize' which actually has something to say. You can't deny the band can pull a good pop-rock anthem out of the bag, but while 'Let's Get Rocked' and 'Make Love Like A Man' are strong, rhythmic stadia tunes, the lyrics - like those in 'Pour Some Sugar On Me' and 'Armageddon It' - leave much to be desired. 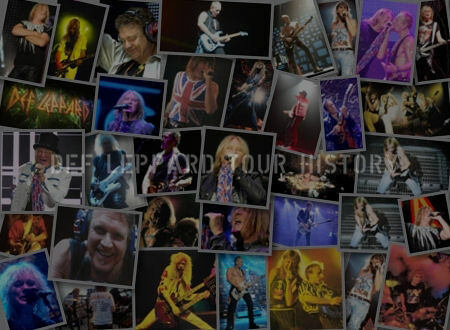 Yet it's 'Let's Get Rocked' that grabs much of the audience's attention as they punch the air as one, allowing Leppard to vacate the stage to deafening applause." 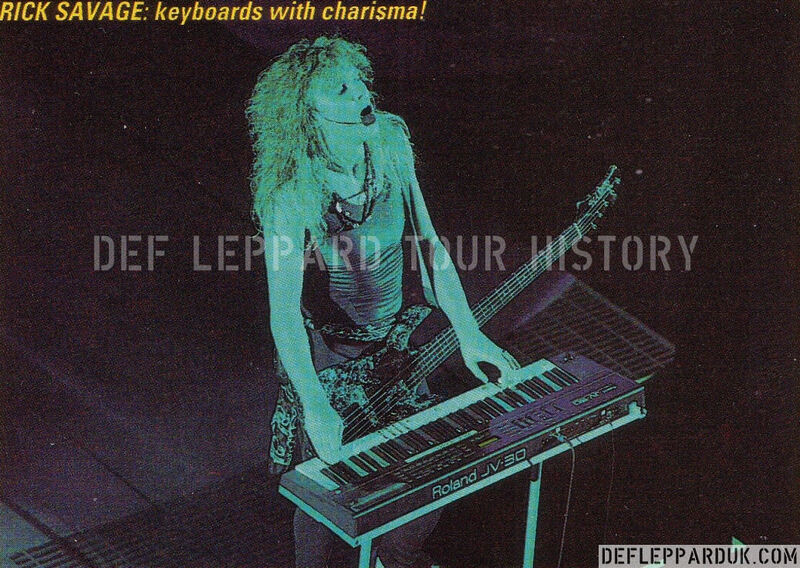 "Def Leppard deserve it though, because despite my usual nit-picking they don't appear to to be doing much wrong, especially with such a spectacular stageshow to hand. That show is surely crowned during 'Rocket', when the lighting capsules descend ominously as if to crush the band like ants, before moving outwards over the audience. Meanwhile, bassist Rick Savage leaps atop Rick Allen's drum platform and the pair move upwards on a hydraulic riser, KISS-style, giving the impression that the drumkit is taking off. Perhaps only Iron Maiden will be able to top this gig this year. Then again, perhaps not. 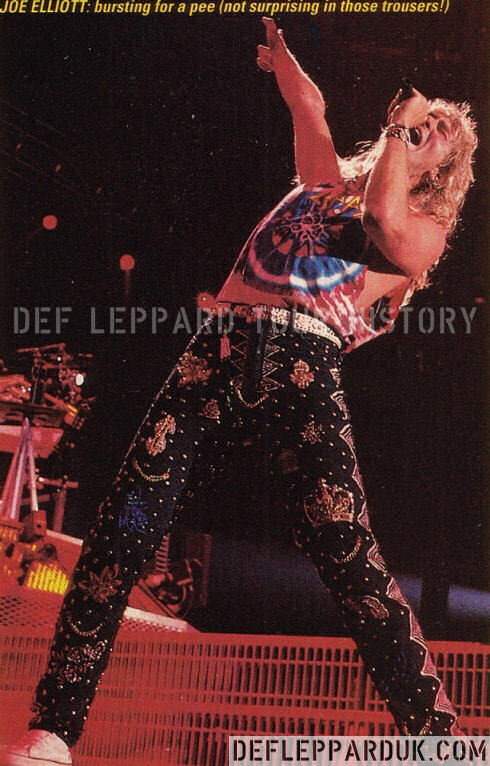 Earlier the same day Def Leppard were awarded a prestigious Silver Clef award at The Silver Clef Awards. The awards and lunch took place at the InterContinental Hotel, London, England on 26th June 1992. The band members attended the event with their wives. Among the awards given out was the Silver Clef award. This is given to artists for outstanding contribution to British music. The awards benefit the Nordoff Robbins music therapy charity. 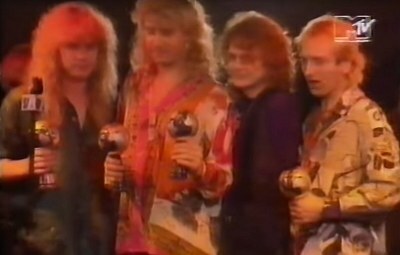 Def Leppard were the 17th winners of the award which was first given out in 1976 to The Who.